Connetecting to FitShow/G-fit sports app allows you control speed and track all kinds of data on you phone. This electric treadmill is motorized with a low noise motor. You can enjoy your workout without disturbing others. [Space Saver Design]: Foldable design and transportation wheels allow for easy mobility and portable foldable treadmill for storage,fold it up and walk away-in one easy step,pefect for home , dormitory, office use.Sturdy steel frame, durable to use; support maximum weight up to 220lb/100kg. [Multifunctional LCD Display]: Multi-functional display that allows user to Track progress in speed, distance, heart RATE and calories burned. You can clearly see your performance and progress. Help you make a perfect workout plan according to these data. 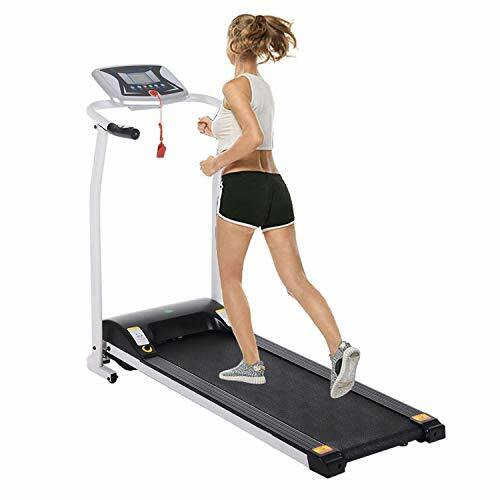 [Suitable for]: This treadmill is the perfect tool for losing weight or working out. Its durable, reliable and loaded with valuable features, help you exercise and improve your confidence, great for family women, office workers, students. US STOCK，1 year warranty & Friendly Customer Service; Free installation design! Received in folding size. Before used, you just need to put the screws on. Convenient and time-saving. If you have any questions about this product by Miageek, contact us by completing and submitting the form below. If you are looking for a specif part number, please include it with your message.